Are there any particular apps you use most often or you couldn’t do without? Amethyst – for all the Xnomad geeks out there, this thing is a life saver, I will not go without it! F.lux, BetterSnaptool, Synergy (cross platform keyboard and mouse sharing utility covered here), VMware, Adobe CS6 suite master collection, FL Studio 10 producer edition, Logic Pro X, Aperture, Final Cut Pro, Cinema 4D, Wireshark, Volatile, CyFIR from Cytech, Brew, mutt, tmux, piano bar, Wee Chat, Connect Wise, LogMeIn, Cisco Jabber. There is so much I use, but that’s pretty much the gist of it. For those who want to use multi monitors, you will need “Diamond BVU195 HD USB 2.0 to VGA / DVI / HDMI Adapter (DisplayLink DL-195 Chipset) ”, and make sure you download the latest display link drivers for it, or it will NOT work. I had the same thought. Never heard of one. Seen a 768, 750 and 1,024 but never heard of a 800. I would prefer higher quality pictures of the setups, this one is a little hard to see what is going on and it took me a while to find the MacBook Pro. Also, what’s up with the lady on the big screen?? LOL!!! What kind of Lag are you getting with 3 USB Display Adapters? Thinking it’s not going to run very smoothly. Cyber Security Pro Workstation? Really? You don’t game on your computer? jealousy is a sad mental issue, you should get help. everyone is allowed to play games, it’s not just classed to one type of person. It is possible to have 4 monitors on Mac Book Pro? I’m surprised your mom lets you put that stuff in the wall. And seriously, this is not a setup, it’s a list of all the stuff he has. Who cares about his watch? Looks like a Mac setup to me. Why are you such a crank? Did you wake up on the wrong side of the bed this morning, T-Bone? jealousy is a sad mental issue, you should get help. i smell a pathetic human being by the kid name t-bone. i listed the watch because in the larger picture, (which they didn’t use they edited the file size) you can see everything on the desk, it’s listed incase someone asks, because it’s very hard to find some of the things in the room if someone wishes to buy them. get some help kid. LOL – Genius, that stirred up the troll and his words! Wow, this is an AMAZING setup. I wish there were more pics! I had NO idea you could drive that many monitors off of a MacBook Pro, VERY cool. Good performance? Any degradation in speed from that? Makes me want to upgrade! Is the PC running Linux as well as Windows? I know we’re not supposed to ‘like’ PC’s as Mac users (according to the unwritten rules) but you can’t beat gaming on a PC… Macs are just not built for games. Love the overhead LCD TV with PS3 too, what a great way to burn off steam or pass the time while waiting for tasks to complete! yes the pc runs arch linux, built with no DE just AWM (Awesome Window Manager) a window managing Xorg Framework, thank you for the kind words, seems to be a lot of haters in here these days. only one of my displays uses the adapter and it runs at 40-50 fps not too bad of a lag at all, and there is no loss in performance, but i will tell you, adding more screens add about 10mb of ram per screen, it’s minimal but it is notable as this increases per resolution, so running over 1080p you can see a 50mb increase per screen, it’s just something to note. Why do the complainers and haters even bother commenting? Internet trolls are the worst. This is a great workstation. 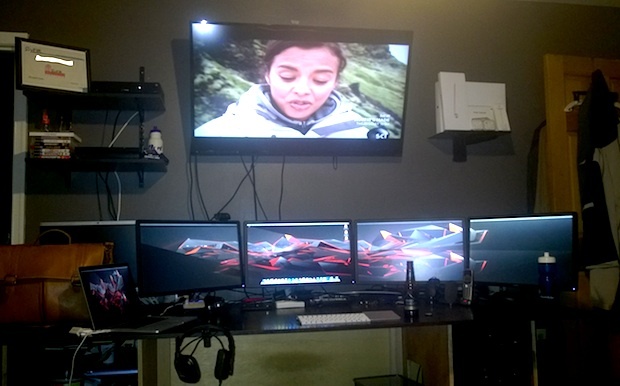 If you’re whining, how about we see YOUR workstation! Don’t bother with all the free hate, I believe you worked hard to achieve such an awesome setup. But there is something that I (IMHO) think is incorrect. It’s not a Quad monitors setup, it’s a “six” monitors setup, as the HP is part of the list and also the “Macbook Pro screen” could be mentioned/used as monitor if needed. I think we all should see as this work station as optimistic addition.